In a small German town tucked away from the rest of the tennis world, there is a street named for Roger Federer at a grass-court tournament that he's won seven times. This week, the Swiss man many call the greatest of all time goes for his eighth title in Halle near Roger-Federer-Allee, but his vision is focused beyond - to another tournament that he'd like to win an eighth time: Wimbledon. "Wimbledon has been a big goal this season for me and I'm happy how my body is feeling," Federer told USA Today Sports in an exclusive interview Tuesday. "I'm still here to do well, to win tournaments, to win Wimbledon, to do all these things. We're in the grass-court season, and I'm thinking ahead. I have a clear picture for what's in store for the next month." What once was routine is now something Federer seeks more than anything in his career: another Wimbledon trophy. The seven-time champion won five in a row from 2003 to 2007, part of his record 17 majors in tennis, the most of any man. But he hasn't been crowned the king of any major since 2012, when he won No. 7 at the All England Club. A bad back hampered his results in 2013, springing over-the-hill and washed-up questions on the 33-year-old. But the world No. 2 said he feels as motivated and fit as ever. He discussed embracing and facing the pressures that go along with being the sport's biggest star, and said his most valued time with his twin girls, who will turn 6 this summer, are family trips to the ski hill. He also has a set of twin boys, born last year. How long will he keep playing? It's a question he doesn't think about often, he said. "It's about just playing for the right reasons, which is No. 1 because I love it and No. 2 because I want to be successful," Federer said of his continued motivation on tour. "I mean, for me to play on the tour and make the quarterfinals every week, it's not bad, but it's not going to - after everything that I've gone through - it's not what is going to keep me on tour. "I need to play well and feel like I can beat the best and win the biggest tournaments and as long as I feel that way, I'm clearly going to keep playing." 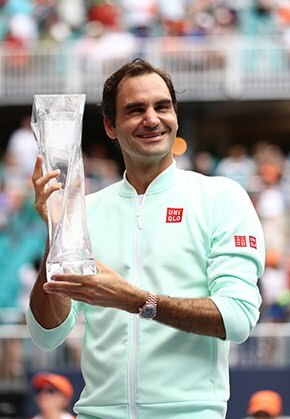 That has been Federer's Achilles' heel the last three years: Failing to beat his biggest rivals - namely Novak Djokovic, Rafael Nadal and Andy Murray - at the majors, and increasingly falling to opponents he'd previously proven bulletproof against on the sport's greatest stages. 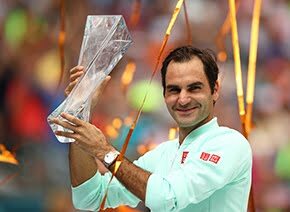 It's also a time that Federer has become tennis' most sought-after commodity, for fans and tournament organizers alike. He's learned to balance the adoration and the constant pressure, which has been heaped on him for a greater part of a decade now. "I don't freak out about it like I used to when I was younger and up and coming and I felt like all the eyes were on me. I'm more laid back today," Federer said. "At new tournaments I feel a bit of the pressure having to perform and having to win, really for people who buy tickets and the tournament director and myself, who has high hopes." "It's extraordinary what he brings to an event. He's a legend," said ATP World Tour President and Executive Chairman Chris Kermode. "He feels comfortable on Wimbledon on the grass. No one can rule him out from winning a major tournament on grass. He's fully capable of doing it." 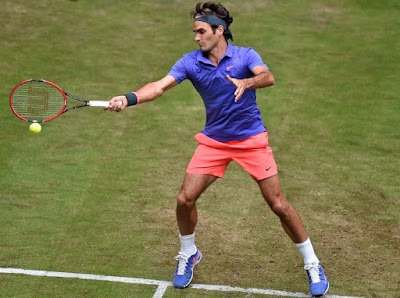 Whether he will be able to do just that will take shape when Wimbledon begins on June 29, a full three weeks after the end of the French Open, a week longer than previous years. On Tuesday Federer sat on a wooden deck chair on a hotel's back patio here, dressed in a sporty green Nike track jacket. Over neatly trimmed hedges across a pond, fans tried snapping long-distance photos of Federer, who appeared oblivious to their ogling. Nearby staff asked him if he'd like them to quit smoking from a few tables away. When he said he didn't mind, they stopped anyway. "Today I'm very professional to my everyday approach to tour, because I know it's a privilege what I'm going through," Federer said. "I know that many other players would love to be competing at the highest of levels at all times, and I get to get this opportunity. I don't want to waste it; I want to make the most of it." The man who dreams of winning another Wimbledon doesn't dream at all in his sleep, actually "No, I never dream to be honest", but he does let himself visualize hoisting another trophy in SW19. "Sometimes when I don't expect it, it happens to me," Federer said of the images in his mind. "I don't necessarily sit down and visualize it, but those visions do come." The past titles help, too. "I don't live in the past, but the past is good and no one can take that away from me. Maybe it relaxes you a little bit, but I don't want it to make me too laid back. It allows me to say, 'Look, I've had a wonderful career, whatever comes now is just great." And while looking back at his career is something he tries not to do, it's something he revels in with daughters Myla Rose and Charlene Riva, on family trips up to the ski hill. "We dress them up and it's a bit of a battle sometimes because of all the layers, but we pack them in the car and go," Federer explained, laughing. "I love those moments just in the car, with them in their boots and helmets and I'm driving and looking back in the rear-view mirror and just thinking, 'This is so cool.' It reminds me of my own childhood. I love that about spending time with them."